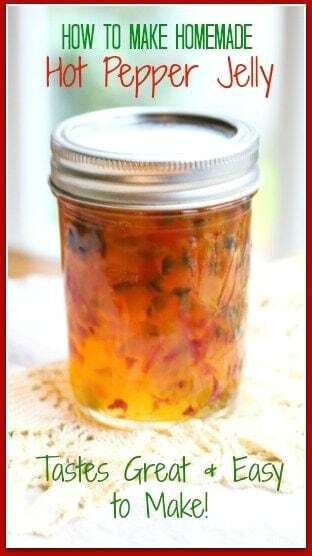 Beautiful in color & sweet with heat; this homemade hot pepper jelly recipe is perfect for entertaining when served on the top of cream or goat cheese. Here in the South, Pepper Jelly is a beloved jelly. Beautiful in color, and sweet with a little heat; this classic jelly is perfect for entertaining by serving it on top of cream cheese or goat cheese. It also makes a great glaze for a pork tenderloin, hot wings, or salmon. Follow these steps and to learn how to make your own homemade hot pepper jelly. 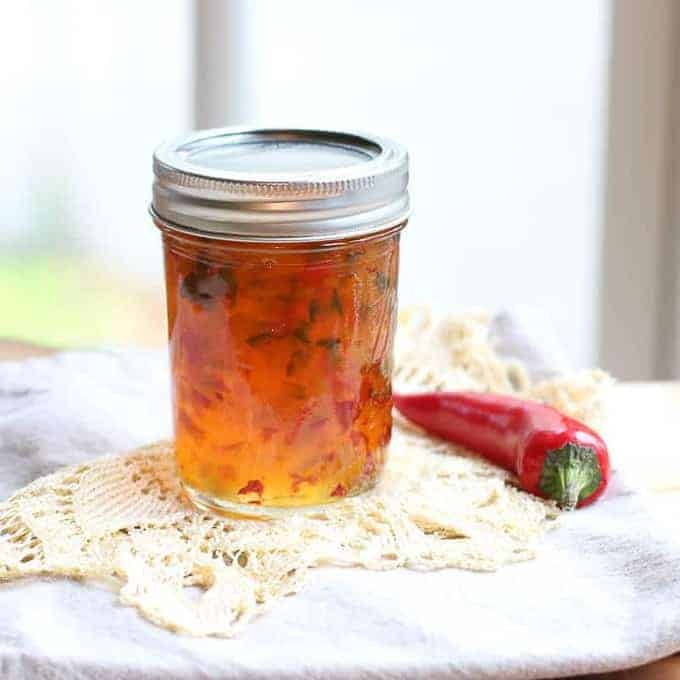 Be sure to make extra, this Homemade Hot Pepper Jelly is great for gifts. My family loves this hot pepper jelly recipe. We have it over cream cheese at all of our gatherings. Homemade is the best. I hate it when we run out of our homemade jars and have to put out the store-bought stuff. It is never as good. While there are a few steps and it is a little time consuming, the Hot Pepper Jelly is pretty easy to make. *This post contains affiliate links. My mother came over recently and we spent some bonding time making jars of this stuff. We had a great time making it. Set your jars and screw bands to dry in a clean area. Add your peppers to a large pan over high heat. Mix in vinegar and fruit pectin. Stir constantly and let it reach to a rolling boil. Once it reaches a rolling boil, remove from heat. At this point, you want to add sugar. Stir well and put it back on high heat, continually stirring. Let it reach to a rolling boil and boil one minute. Remove from heat. Skim off all foam. Ladle jelly into 8oz jars filling to 1/4in from the top. Cover with flat lids and screw on screw bands tightly. Place jars into canner. Water should cover jars completely. Water should be hot, but not boiling. Bring water to boil and process 5 minutes. Pull jars out and cool. *NOTE* If you live in a high altitude, you will need to adjust processing time. Here is a chart. Cooking Note: Scoop one ladle of pepper jelly in each jar to evenly distribute peppers before completely filling each jar. The peppers rise to the top. If you do not evenly distribute them, you will have no peppers left for the last jars. Cooking Note: If you do not want your Pepper Jelly Hot, substitute Jalapeños with Red Bell Peppers. If you want a spicier jelly, use a hotter pepper. I used red jalapeños for this batch. If you like this recipe, check out: Jalapeño Cilantro Hummus , Fresh Hot Jalapeño and Garlic Relish, and Jalapeño Chimichurri Sauce. *Disclosure: I held the jar lifter upside down when I was videoing. I did not know at the time I was doing it incorrectly. That was a mistake on my part. Do not grip the jar lifter on the same side I was using. 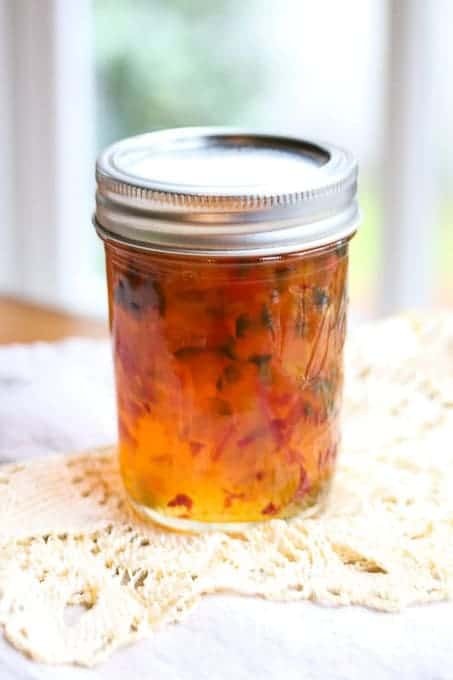 Beautiful in color & sweet with heat; this homemade hot pepper jelly recipe is perfect for entertaining when served on the top of cream or goat cheese. This recipe makes six 8oz jars. Sterilize six 8oz canning jars and lids in boiling water. Place all peppers in a large saucepan over high heat. Mix in vinegar and fruit pectin. Stir constantly. Bring to a rolling boil. Remove from heat. Add sugar and place back on high heat. Return to a rolling boil for one minute. Remove from heat. Skim off any foam from top. Ladle jelly evenly into sterile jars, filling to ¼ inch from top of jar. Cover with flat lids and screw on screw bands tight. Scoop one ladle of pepper jelly in each jar to evenly distribute peppers before completely filling each jar. The peppers rise to the top. If you do not evenly distribute them, you will have no peppers left for the last jars. If you live in a high altitude, you will need to adjust the processing time. Here is a chart for reference. Pepper Jelly has a very vinegary and tart taste mixed with sweetness. I am not sure how that will blend with the smokiness of a chipotle. It could be amazing or it could be awful… I honestly don’t know. I am sorry. If you do make it that way and it turns out, please let me know. I am curious now. I have had hot sauces with a vinegar base and chipotle pepper that was good, so I would think it would be good… I just don’t know. Could the Jalapeño be replaced with a chipotle or two instead???? My daughter and I really enjoy the smoky & fruity flavor of them..
*smiles* have even made homemade chocolate syrup with chipotle…. One cup of vinegar is plenty. I would not add more. Is one cup of cider vinegar enough for this many peppers? Some recipes that I have seen use two cups for four cups of peppers. What would happen if I used more vinegar? I plan to use Pomona Pectin. After it cans and cools completely. It won’t be a strong firm jelly like some other jellies, but it should set and firm up. Hi, question? Does it become jelly right away? Or after you can and cool it? I am so glad you liked it Kim! Thanks for sharing. I am so glad you liked it. Thanks for letting me know. I just made this last night , first canning experience, and was surprised at how much easier it was to make than what I expected. I tasted it this afternoon and it was delicious. I will definitely make it again. I was delighted that all 6 jars sealed! I think I see canning becoming a hobby! Just made a double batch, tasted it before it set.. tasted amazing.. made several jars for gifts !!! I’ve used this recipe twice, first attempt (last year) was pepper syrup. Tried again last week, precisely following directions, again pepper syrup. Both times I reboiled & added pectin, came out fine eventually but 2x the time/effort. If your goal is traditional pepper jelly do one or the other (not both): squeeze as much moisture as you can from peppers before boiling. Or, after adding sugar do rolling boil for 10 min’s (instead of just 1 min.) – rolling boil is such that the mixture boils rapidly while stirring. Proper set-up requires a good amount of evaporation, much more than boiling for just 1 min. as directed (step #4). GREAT taste! A big holiday hit. Thanks. I wouldn’t recommend it.The apple cider gives it a special flavor. Would it be OK to use white vinegar instead of apple cider vinegar?? This is the first time for this recipe-very good! The yellow peppers and the hot peppers from our garden the red and green from supermarket. Will make again make. Hey there! I tried making this last week and it was quite mild. Definitely going to swap out the green pepper for jalapeño. Unfortunately all of our peppers enddd up at the top of the jar. Any suggestions to prevent that? We are using 125ml jars as these will be our wedding favors! It takes 24 to 48 hours to set so it is normal that it did not gel immediately. This recipe also is a bit runnier than the thick, stiff store bought versions. If it is too runny after a couple of days, here is a link to help. I made a batch of pepper jelly using this recipe and it didn’t gel immediately. Woukd you tell me why it didn’t gel? Another question… can you use Splenda instead of sugar to make pepper jelly? No. This is a vinegar based jelly. Sorry. Thank you Lynda! I appreciate the positive feedback! Videos are not my strong point so I am glad that someone likes them ! I loved your video, and I usually don’t like cooking videos, so easy, straight forward, and fun music. Made this wonderful pepper jelly today….soooooo goood! I followed the recipe exactly except I did drain the peppers do excess water. This has just the right amount of heat for normal people, however, since I like it HOT HOT and Hotter, I will make another batch just for me tomorrow. Thank you for a great recipe. I would have given this a 10 Star! If you store them in a cool dark place and properly seal them, they should be good 18 months to 2 years. Thank you so much for the recipe! I’m excited to try this out tomorrow as i just bought the cans today. My question is, what is the shelf life for this jelly? What a great recipe! Flavors really blend. I doubled the jalapeño peppers and it was still very mild. I’m adding 3/4 c to the next batch for those who like a bit more heat. This makes beautiful gifts for Christmas. Thank you for sharing! Oh no, very disappointed. I followed this recipe to a T and it didn’t thicken…..very runny. How long does it store on the shelf? Do you have the recipe for the cranberry jalapeno jam? With ghost pepper . Sound yummy! I made this yesterday and my friends said it was good!It was easy thanks to your step by step instructions and pictures. A few years back my husband took up the hobby of growing extremely hot peppers. The first year he grew ghosts and reapers, fatiliis and a few others that I had never heard of along with some that I had: habenaros and jalapenos. By the time we harested those 25plants had produced enough fruit to cover my dinning room table and then some. So while he insisted that he was going to use all of them, only about half of them got used even after a make your hot sauce party we had with 6 other couples in our neighborhood. Needless to say I searched high and low for any recipes that used hot peppers. This was one of those recipes. I add different fruit sometimes and basically follow the recipe for that particular fruit from the ball canning recipes or on the pectin packages. My favorite is cranberry and jalapeno jam that we add hlf a ghost to. Most people are amazed that a ghost pepper has such a wonderful flavor to it once you are able to cut down the heat of it 20 fold. 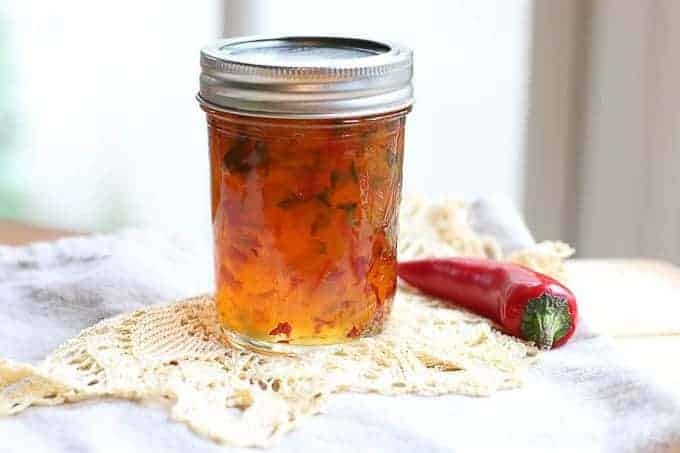 Anyway, thanks so much for posting this recipe and if you have never tried pepper jelly I would highly recommend it to anyone…no matter whether you like spicy food or not. Pepper jelly over cream cheese is an absolute must in our house. Even for my 10 yo daughter whom hates anything spicy. Hmm…. it shouldn’t be liquid. It can take up to a week to set. Is it runny or liquid? If it is liquid, I am not sure it will set. Here is a site that gives tips on what to do if it does not set properly: http://foodinjars.com/2011/08/canning-101-how-to-save-runny-jam/ If you don’t want to go through the process again, you can use the jam as a glaze for things like fish and chicken… It is really great as a glaze over meatballs as an appetizer. Hope this helps. Hi Katie, I made this jelly last night and it came out beautifully. Only one jar did not pop so I put it in the fridge. But my question is this, How long does it take to set up. This morning it is still liquid. Should I give it a day or two. Thanks Katie. Appreciate your help. Will be making some today. Will let you know how it turns out. The last batch was really thick, but does have great flavor. Will try it leaving in the juice from the peppers. Will let you know how it works. Have a happy day. I hope you love it!! I like mine a little hot also. My family is more on the weak side, so I keep it mild for them. 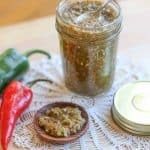 If you like hot and spicy, check out my jalapeño salt and jalapeño and garlic relish. You will love it. Hi Patti. This is a jelly, so it is supposed to be thick…however, if you heat the jelly before using it, it will melt into a sauce. It is wonderful as a jelly on cream cheese, brie, and goat cheese served with crackers. It is also good over cream cheese on a bagel. Mine usually comes out a bit loose almost like a jam because I don’t drain the juice. If you want yours a little more loose, I would suggest keeping the juice. Either way, I am sure it tastes fantastic and you will love it. Hi Katie. I made this a couple weeks ago. I make rather large batches and use a meat grinder for the peppers. I end up with a lot of juice from the peppers which I drained. I cooked according to your instructions and it looks beautiful but as it sat it became very thick. What could cause this. It will not pour out of the jar, need to use a spoon. Any ideas how to thin it? Planning on making more next week and could use your help. Katie I made some last year using a different recipe it just wasn’t hot enough and didn’t set up so had to open all jars and reboil add more pectin. What a hassle. . I used your recipe today on a batch made one slight change I substituted more jalapeños for green peppers, my family likes a bit more heat. It’s in the water bath now I I can’t wait to try it. This recipe doesn’t get perfectly firm… So it should be fine if it moves a bit. It will firm more as it sets. It does resemble more like a jam. Thank you Krista! That is so nice to hear! You made my day!! I like the pictures you posted of your family making this together! The instructions are great too, nice presentation! I made this jelly a few weeks ago, it is easy and looks very pretty in the jars. It tastes wonderful, just had some last night on a brick of cream cheese, served with crackers. Guests loved it! Just made a batch of these. Used a combination of banana, Priscilla and jalapeño peppers. Will be on the spicy side for sure. Hope they turn out ok. This is look wonderful! I have tons of pepper in my garden. I definitely will try this and will add couple of habanero cause my husband love it. Making homemade preserves is so labor intensive, but I still love doing it! My favorite thing to make and can is rhubarb jam. This recipe looks delicious! I haven’t had hot pepper jelly since my mother passed away! This recipe reminds me of her! I can’t wait to try it! This jelly is so beautiful! I love giving it as gifts, but I also love getting it as a gift! You just can’t go wrong with it in your gift basket. Love the color! My goodness, this hot pepper jelly looks incredible. I’m sure I would find excuses to put it on absolutely everything. Omg these look awesome and so easy to make! I am all about homemade all-the-things. Love this kicked up jelly. Pepper jelly can be used in so many different ways. I have always wanted to make pepper jelly! You’ve talked me into it!